Claúdio Braga’s Marítimo are currently 12th in the Primeira Liga after three wins from their opening nine matches this season. Os Verde-Rubros’ finished 7th last season in the Primeira Liga after coming close to securing a UEFA Europa League spot. The Madeira side, who last qualified for the UEFA Europa League in the 2011/2012 season, have registered 10 points this season and have lost five and drawn once in the 2018/2019 Primera Liga campaign. Marítimo, who have scored six goals and conceded 12 so far this term, face bottom side Nacional tomorrow inside the Estádio da Madeira. 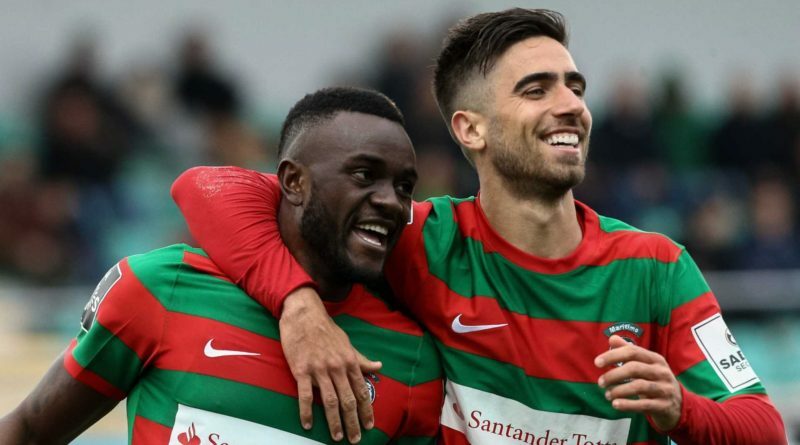 Marítimo are looking for their first win in five matches after a patchy spell of form in the Primeira Liga. Throughout December, Marítimo face Vitória Setubal, C.D. Feirense, Benfica and Tondela. Marítimo, who are ranked by the IFFHS as the fifth best Portuguese club of this century, have finished in the top six on four occasions in the last 10 years in the Primeira Liga. Before Marítimo’s Primeira Liga game against Nacional, FOX Sports Radio 96.9 FM/1340 AM’s Dean Perretta very briefly caught up to get thoughts from Martímo and Cameroon forward, Joel Tagueu, currently on-loan from Campeonato Brasileiro Serie A side Cruzeiro, to quickly share his thoughts on Marítimo’s goals and ambition this season, as well as next summer’s much-awaited 2019 Africa Cup of Nations tournament. Dean Perretta: Firstly Joel, what are the main expectations and goals for Marítimo this season? Joel Tagueu: Our goal is to qualify for the Europa League. Dean Perretta: What are your thoughts on your form this season compared to last season? Joel Tagueu: We have a new coach, and some new teammates. We are going through a less positive phase right now, but we need to turn around and win again. Dean Perretta: What was the biggest factor joining Marítimo on loan? Joel Tagueu: The Challenge. I had been in Brazil for some time, and I wanted to move to Europe. Dean Perretta: What are your thoughts on Claúdio Braga’s style as a manager? Joel Tagueu: It’s a different style from last year. It is up to us to work to be able to give the answer in the style of game that he wants to implement. Dean Perretta: Finally, the African Nations Cup is next summer. How confident are you that Cameroon can challenge for the title? Joel Tagueu: Yes. We have good chances. We have several players on big teams in Europe. We have full conditions to reach the tournament and defend the title.